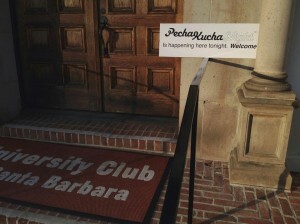 We are pleased to host the 6th PechaKucha Night in Santa Barbara at the University Club of SB. Doors open at 7:00 pm, with presentations starting at 7:45 pm. A $7 donation to help pay for the venue will be accepted at the door. Drinks will be available for purchase at the bar inside the University Club. Linda Croyle: You Must Be Present to Win – How our distractions keep us from health, happiness and success (and what to do about it! Presentations are now up on our Youtube account from our first event. Videos are also listed below. 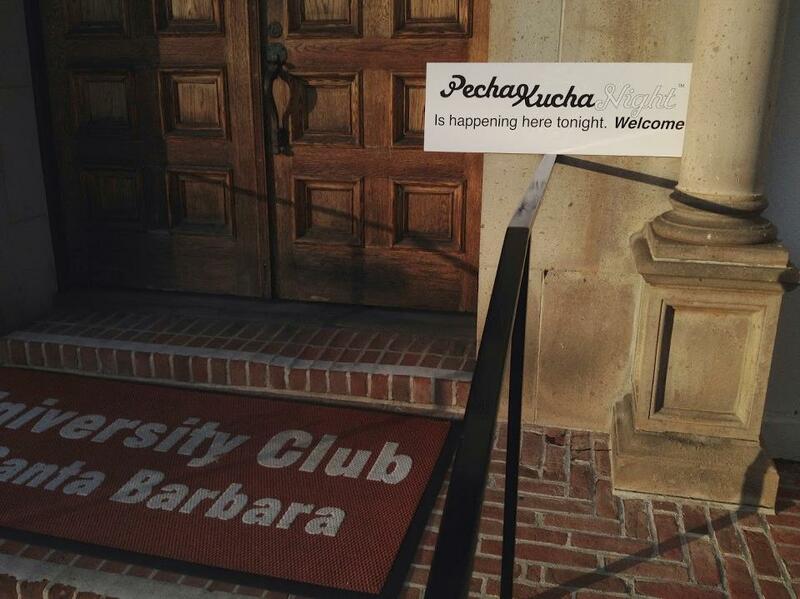 We are pleased to host the 5th PechaKucha Night in Santa Barbara at the University Club of SB. We have some super interesting local individuals who are scheduled to present. Each presenter will be allowed 20 slides, with 20 seconds of talking time, per slide. 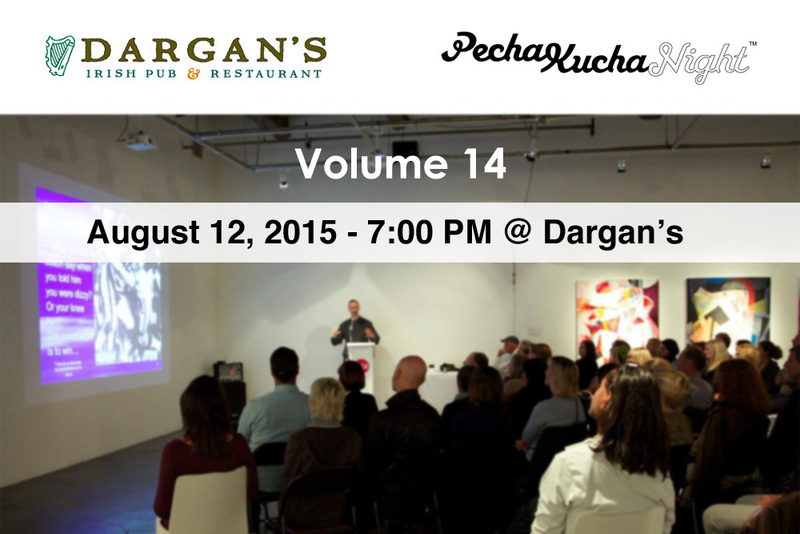 We are pleased to host the 4th PechaKucha Night in Santa Barbara at the University Club of SB. Presenters: Michelle Shapiro, Alex Loorz, Patrick Gregston, Amy Cooper, Ryan Gantz, and Chris Farmer. We are pleased to host the 3rd PechaKucha Night in Santa Barbara at the University Club of SB. Doors open at 7:00 pm, with presentations starting at 7:45 pm. A $5 donation to help pay for the venue will be accepted at the door. Drinks will be available for purchase at the bar inside the University Club. We are pleased to host the 2nd PechaKucha Night in Santa Barbara at the University Club of SB. We are pleased to host the first PechaKucha Night in Santa Barbara at the University Club of SB. Doors open at 7:00 pm, with presentations starting at 8:00 pm. A $5 donation to help pay for the venue will be accepted at the door. Drinks will be available for purchase atthe bar inside the University Club. A chef for 17 years and currently reside in Los Angeles, California. I have had the honor of being the Personal Chef to Microsoft’s Paul Allen, Antonio Banderas, Melanie Griffith and Eddie Murphy, just to name a few. Roberto classically trained in Paris, and the South of France, along with studying pastries with Albert Adria at Spain’s renowned chcolate school, Chocovic. Currently his attention is focused on his dining group called “CR8” creating and exploring new dining experiences. A consultant in the emerging field of complementary currencies, or generative currencies as she likes to call them. She works with Bernard Lietaer, an international expert in the design and implementation of currency systems. Her aim is to spread the word far and wide about our capacity to create monetary ‘ecologies’ that can address our economic and environmental challenges. She sees this as an essential aspect of our waking up to who we really are (creators and not victims) and to the nature of reality in its interconnectedness. An entrepreneur, episcopalian-buddhist, and eternal learner, Faye lives in Santa Barbara where she is working to sow the seeds for an ecology of currencies locally. Otherwise she can be found walking her dog on the beach or reading books with her granddaughter. An interaction designer, inventor and entrepreneur. He recently moved to Santa Barbara from Seattle. Debby is the producer and director of What Babies Want, an award winning documentary film about babies. A chiropractor by formal training, Debby Takikawa founded the nonprofit organization, Beginnings, Inc. in 2001 as a way of supporting a clinic and teaching facility for children and their families who were facing attachment issues, birth trauma, and other health challenges. An artist, poet and educator. He teaches at UCSB and in New Zealand. His interest is on the people and places of the Pacific Ocean, and has been writing a column for the Santa Barbara Independent called “Meet the Pacific”. He’s the author of over 100 articles and books on biodiversity conservation. He’s lived in Santa Barbara for 20 years. Assistant director at the Multimedia Arts and Design Academy at Santa Barbara High School. Currently teaching a class on blogging. Bruce is the founder and current executive director of the New Media Studio and the New Media Research Institute in Santa Barbara. Bruce was trained as a social anthropologist and an urban cultural geographer. He is skilled in a variety of multimedia authoring tools, and completed the first multimedia dissertation at UC Santa Barbara. Through the New Media Studio and the New Media Research Institute, he is realizing the goal of bringing new tools and skills to the public to help democratize the technological advantages of the digital revolution.